They’re calling it a glitch … a hiccup. A one-time issue that no one can explain. I’m talking about Netflix Inc.’s (Nasdaq: NFLX) second-quarter earnings report. The streaming content provider beat per-share earnings expectations handily, but came up short on quarterly revenue and subscriber growth. But it’s not a just a one-time issue. We saw this same kind of activity from Netflix back in the second quarter of 2016. It elicited the same response from investors — panic selling. Netflix stock plunged as much as 16% following both its 2018 and 2016 second-quarter reports. The same concerns about tapped-out subscriber growth and increasing competition from Amazon, Disney, Hulu and HBO also remain. They are recurring themes when it comes to Netflix, and they are blamed anytime CEO Reed Hastings so much as sneezes. When you only look at quarterly figures, it’s easy to get whipped up into the frenzy surrounding short-term trading trends. But when you pull back and look at the broader trends, you can see that Netflix remains a solid investment. Take subscriber growth, for instance. Short-term investors use these quarterly subscriber figures as excuses to sell and take profits off the table, or to ramp up their Netflix holdings until the next quarterly report. This time around, investors panicked and sold because subscriber growth came up short of analyst expectations. Those expectations were set on a quarter-over-quarter basis. 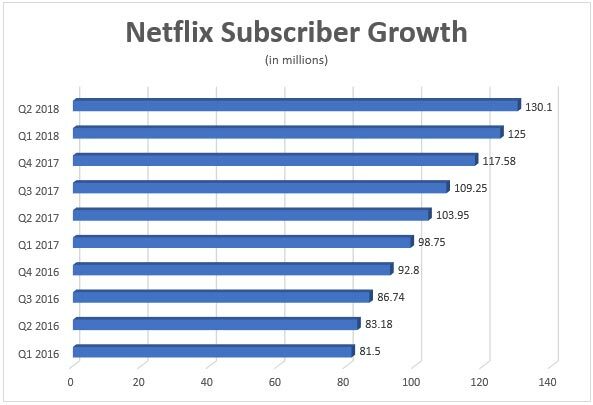 By that metric, Netflix saw subscribers increase by only about 4%, well below the prior quarter’s growth rate of 6.3%. It was seen as a slowdown, thus meaning that Netflix was facing stagnation. But when you pull back for a year-over-year comparison, Netflix saw subscriber growth of more than 25%. In fact, Netflix has averaged year-over-year subscriber growth of 25% for at least the past four quarters. At the bottom of the above chart, you can see the last time Netflix flopped with quarter-over-quarter subscriber growth. In the second quarter of 2016, the number of subscribers only grew 2%. The panic that ensued was like what we saw this past week, with NFLX stock plunging roughly 16%. 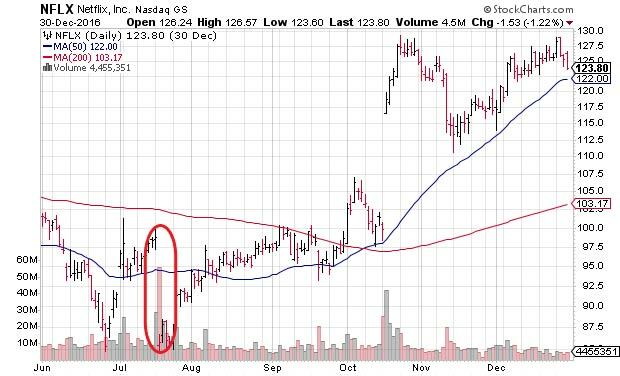 But, as the chart below shows, that second-quarter glitch was a significant buying opportunity for Netflix bulls. This time around, things are slightly different for Netflix. The stock is up roughly 90% this year even after the post-earnings plunge, as opposed to a 13% decline heading into July 2016. This year’s momentum could be a bit of a drag on the shares, as analysts raise concerns about frothy stock valuations. However, Netflix remains one of the new Big Three in the next generation of media and entertainment. As we saw with 2016, dips like this one are clearly buying opportunities. Lastly, there is sure to be some market volatility in the coming weeks and months. My colleague Ted Bauman is calling for a market crash and for good reason. But, as Ted notes, solid companies with lasting value will hold that value, even after a market shake-up. Netflix, I believe, is one of those companies. 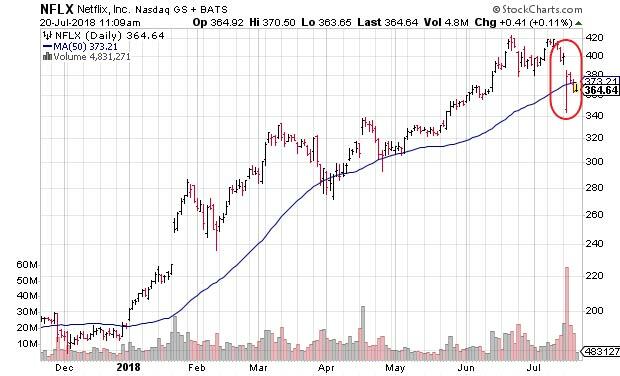 For those buying into Netflix now, set your buy range between $355 and $365. And in the event of a market drop, paying anything below $300 for Netflix stock is a steal.